Cabinet Production - Our Computerized Wood Shop | Salon Interiors Inc. Salon Interiors maintains a fully computerized wood shop with cutting edge machinery operated by experienced personnel. Job requirements for either multiple units or "one off" specifications receive the same painstaking attention to detail from initial bid to project completion. In addition to our automated equipment, Salon Interiors employs craftsman dedicated to the art of woodworking. Detailed hand finishing and inspection are performed on each unit that Salon Interiors produces. Salon Interiors is always looking for ways to streamline our production times while increasing the accuracy and detail in our finished pieces. Our recent purchase of the HMT Automated Laminating Machine lets us offer even more customized finishes for our clients, whether it be a finished cabinet or OEM commercial customer. Working with wood veneers and high pressure laminates, the HMT will speed the process of attaching the finish to the substrate, a process we used to complete by hand. We've recently purchased a Homag BAZ 322 CNC Point To Point machine with automated edge banding and 18-tool tool changer, watch the video below to see this amazing equipment in action. In addition to the computerized technology featured in our wood shop, there are just some things that are better done the old fashioned way, with old fashioned tools. Salon Interiors recently acquired a Rockwell Direct Drive Thickness Planer. Now thickness planers can be found today from many current suppliers, but we'll bet that they can't match the finish quality on the wood we process through this machine. Rubbed with a tack cloth, it's ready for staining. 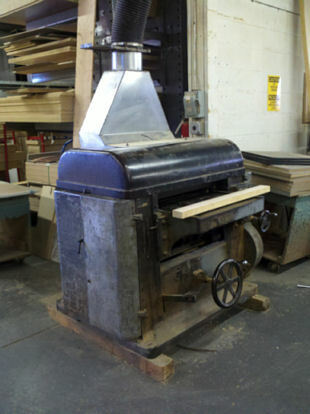 It's capable of handling wood sizes up to 24" wide and 8" high. It's a nice balance sitting in our shop to the huge computerized machines. History combined with innovation, it's the Salon Interiors way. Our designers utilize the latest technology in computer automation before the first piece of wood is cut. All measurements, layouts and specifications are monitored for precision and accuracy. Additionally, we attend continuing education sessions directly from the manufacturers of the equipment. Attention to detail is paramount at Salon Interiors. Salon Interiors wood working shop is the envy of cabinet manufacturers and always under improvement since we are adding new "toys" regularly. CNC-Contour Edge Band Machining Center - 5' x 12' capacity. 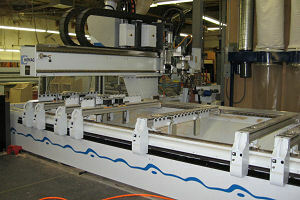 CNC-Router, Saw, Profile, Horizontal and Vertical Drilling, 4' x 9' capacity. Salon Interiors also maintains an on-site upholstery shop allowing us to custom coordinate all aspects of your bid specifications for a fully integrated environment.